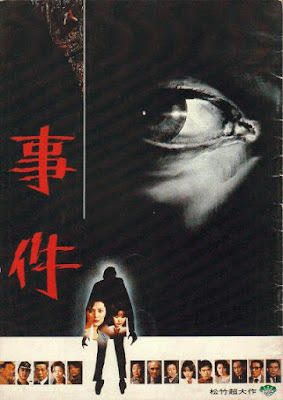 Trial and Error: Yoshitaro Nomura's "The Incident"
Being a huge fan of Japanese director's Yoshitaro Nomura's 1974 film "Castle of Sand", it's easy to see what attracted him to the subject matter of "The Incident", which was released four years later and racked up numerous Japanese film awards. Lengthy, dense and ultimately concerned with the shifting perspectives surrounding the murder of young Hatsuko (Keiko Matsuzaka), "The Incident" plays like a John Grisham novel transposed to Japan. By playing with the viewer's expectations.... giving us snippets of possibilities... parading a host of possible suspects, witnesses and innocent bystanders.... the film expertly navigates the murky waters of young love short-circuited by affairs, questions and insidious personalities. And, since its based on a novel by respected writer Kaneto Shindo, there's plenty of talk about the impact of environment on man. Long a subject of fascination for Japanese culture, "The Incident" makes it clear that the man accused of the murder, Hiroshi (Toshiyuki Nagashima), certainly seems to have little control over the spiraling judicial body firmly deciding his fate. It's no surprise he confesses to the murder in the opening ten minutes of the film. Things only get more complex from there. Hands clutched to his side and eyes fervently poised downward, filmmaker Nomura constantly frames Hiroshi as some sort of fallen Greek god aimlessly watching the jury deciding his fate. There are onlookers as well- namely members of the press, his current impregnated fiance Yoshiko (Shinobu Ohtake, who's also the sister of the victim) numerous witnesses and elderly family members perched just behind him throughout the trial. Alternating between measured, careful dialogue of examination and cross-examination within the courtroom and the moments leading up to and including the murder, "The Incident" walks a precarious line of fact and blurred memory fiction. Just how reliable is the testimony of the witnesses? What exactly is the relationship of Hiroshi and Hatsuko? What do all those furtive glances between suspect and sister in the courtroom really mean? Over the course of two hours and twenty minutes, Nomura carefully builds a web of "Rashomon"-like events that fold and twist and bend around each other. Like he did in "Castle of Sand"- another film interested in the reverberations of the past on the present- Nomura mines an especially stringent intellectual thriller. If the final verdict of the film is far less interesting than the serpentine-like path it took to get there, I feel that's the point. Compared to Nomura's other works (and its a shame more are not available on DVD, including this great film) "The Incident" fits neatly into his worldview of panoramic events whose real apocalypse can only be felt in the hearts of an unlucky few. A father and son in "Castle of Sand". A couple in "The Incident". A weathered, somewhat evil husband in "The Demon". While the whole world seems to be caught up in their own self-satisfying objectives in the death of beautiful Hatsuko, Nomura reminds us in a lyrical yet subtly dark closing shot that, perhaps, the greatest victim of this particular incident hasn't even been born yet. Unlike 2015 where I had to bury deep beneath the surface to find some music I could tolerate, 2016 has been terrific so far. Of course it helps when perennial faves release new albums, but its been nice. I think it'll be hard to top this album for my favorite of the year 8 months hence. I'm leaving off the bad punctuation of the title, which like the rest of the film, is fairly extraneous. It pains me to call this one of Linklater's worst, but there it is. Rekindling the plotless, amiable, time capsule reverie of "Dazed and Confused", this one places his lost and delirious youth at the birth of the 80's and also at ground zero of their college experience. Following a bevy of newcomers (some better, some who fare much worse) during the weekend before school starts, "Everybody Wants Some" is a uniquely masculine experiment, placing focus on the testosterone fueled group of baseball players at fictional Southeastern Texas College. Binge drinking, girl-chasing, swearing and pranks are the rigor, and not much depth beyond that. Linklater strains a few decently human strings together towards the end as young Jake (Blake Jenner, the closest thing the film has to a male lead and our central attachment) forms a relationship with Beverly (Zoey Deutsch) and their awkward, searching friendship takes hold in Brady Bunch-style split screen phone calls and a very intellectually stimulating party. No wonder these jocks feel like they're in outer space when they show up. The final 20 minutes of "Everybody Wants Some" feel like the closest thing to Linklater's previous films of growth, verbal intimacy and endearment. Perhaps it's this historical wealth built up by the filmmaker that would allow him to have some vacuous fun here. Regardless, its still a film of odious personalities who live, breathe and react in an artificial construction of 80's films.... one whose song choices are just as obvious and obligatory as the endless carousing of its dull-headed young men and women. Anna Kendrick and Sam Rockwell maintain sharp chemistry. It's just too bad one has to squint to see it amongst the bad Tarantino-violence. Full review Dallas Film Now. I lost track how many times during Ariel Vroman's insipid thriller I rolled my eyes. This is the type of lazy action film that has every single person's movements tracked by cell phone GPS or facial recognition data, and yet the person everyone's looking for shows up at the home of the female whose central to the plot. Despite being stacked with great talent (Kevin Costner, Tommy Lee Jones and Gary Oldman), "Criminal" wastes everyone involved. 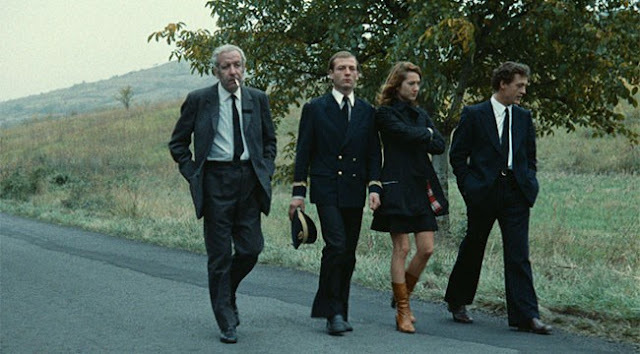 Cinema Obscura: Maurice Pialat's "The Mouth Agape"
Maurice Pialat is a selfish filmmaker. How dare he make a film about the waning days of a mother while conspicuously deflecting her death and turning his gaze onto the father and son and their trivial problems of sexual fulfillment and familial discord. While she's slowly dying upstairs, son Philippe (Philippe Leotard) suffers from impotency with a young girl he picks up on the street. Not to mention he's married to the beautiful Nathalie Baye who seems to understand and even partially forgive his past indiscretions. Father Roger (Hubert Deschamps) also brags about a life long series of extra marital dalliances, his perversity reaching stunning heights as he paws and feels up a young girl who comes into his shop to buy a new t-shirt. After making her undress in order to try the new shirt on, he gives her small pecks on the lips (that she nervously tries to avoid) before sending her on the way with a free pair of stockings. In any other film, Roger and Philippe would be monstrous examples of masculinity,. In Pialat's hands, they transform "The Mouth Agape" into a lacerating study of how grief and inchoate feelings often mar the way we react when faced with dire consequences. Like his previous film, "We Won't Grow Old Together" (which also presents masculinity, patriarchal repression and emotional commitment as crutches for the terrible decisions we make on the ones we love), "The Mouth Agape" isn't interested in presenting a straightforward idea on something so cut and dry as death. It's messy, untranslatable and full of small asides that veer closer to autobiography than acted drama. There's certainly a reason for his selfishness. Opening with Philippe assisting his mother (Monique Melinande) to a hospital visit, the next scene specifies Pialat's real interest. Mother and son talk in a kitchen, for what feels like an eternity in a single take, about a wide range of ideas. As their talk ends, both stand up and mother slightly stumbles, the camera barely able to keep her in the frame as son helps her up. That conversation is the only normal moment in the rest of the film. Eventually dismissed from the hospital and told to have her die in peace at home, "The Mouth Agape" follows Philippe and Nathalie (interesting how the film uses the actors real names) as they travel home to be with mother and father throughout her last days. They quarrel. Philippe has his continued moments of weakness with other women. Roger endlessly leaves the house and slips away to the local bar to have red wine and flirt with tourists. Philippe and Nathalie attempt to reconcile their differences. All the hallmarks of usual French cinema- shifting sexual loyalty, doubt, and the general 'laisssez faire' attitude about things- become the central conceit with a dark underbelly of truth. As writer David Thompson pointed out in his May/June 2004 article about Pialat in "Film Comment" which he gleaned from Pascal Merigeau's biography of the filmmaker, too much of "The Mouth Agape" was culled from Pialat's own life. His mother had died about ten years before and father, also nicknamed 'le garcu" as in the film, died just months before filming began. Likewise, actor and actress Baye and Leotard were, in fact, embroiled in their own relationship during the film, which certainly added to the frisson observed on screen. The coincidences and nods to real life seep off the screen in tragic, pulsing ways. When all is said and done, "The Mouth Agape" does deal with the actual death of Monique, which sends unexpected reactions from the characters and gives the film its emotional hook. For all the carousing and chain-smoking, life's tangible frailty is not completely ignored. And even though the death happens off-screen, acknowledged in Roger's dismissive line of "it's over" to his son who wanders down the family home hallway, one gets the sense its far from over. Monique's presence, love and perhaps even the hatred she might of felt for her husband will resound in their hearts long after the lights of the shop are dimmed. Like Pialat himself, who continued to bleed the personal and private within his public works for years to come, he knows he's flawed. Making films that chisel away at the truth are the only way he knows how to deal with it. The Mouth Agape will be receiving a DVD release from Cohen Media in May 2016.